[Real Diary] A To Z, Details Of Korea Breast Surgery Procedure - 짱이뻐! Interested in getting Korea breast surgery? Here is step by step, from the very beginning to the very end, before and after Korea breast surgery. Full details about the procedure from before Korea breast surgery until exclusive post surgery care. First you can take a subway and stop at line 2 Gangnam station. From exit 10, you can go straight until you see Pagoda Tower. Go to 17th floor. There you can find Wonjin Breast Plastic Surgery Center. TIPS: You’d better make reservation before you go to Wonjin to have consultation to cut your waiting time. When it’s your turn, you will be asked to change your clothes into a gown special made for easier examination. In-depth consultation will be divided into 2 parts. First, you will have primary consultation with breast surgery specialized consultant in order to exactly understand your needs. Also it is possible to check the most ideal size for your body through Size Fit Service. Then after first consultation has finished, you will have consultation with Korea breast surgery specialist (surgeon). Consultation will be done based on the consultation record with the consultant. At this time, type of implant, size and surgical method will be decided. More than 50 medical examinations will be performed to scientifically analyze the patient’s condition and body type. With the result, customized surgery plan will be established. 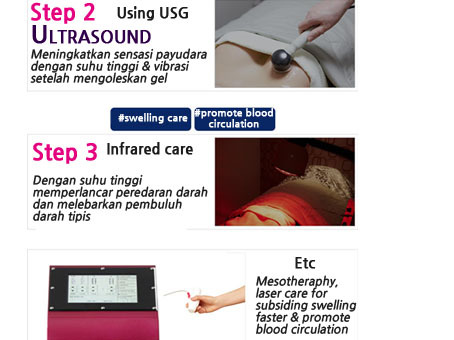 Examination included: in body, chest x-ray, blood test, EKG, Breast ultrasonic examination. Your second visit will be on the day of the breast plastic surgery. Nurse will check your blood pressure and another simple tests, then you will enter the surgery room. The surgery will be done safely at the aseptic operating room which blocks all external contamination factors with one on one personalized care of anesthesiologist. Next visit will be 1:1 consultation about your condition and your breast to decide what kind of post surgery treatment you should get for faster recovery. Wonjin Beauty Medical Group exclusive post surgery treatment for faster recovery are mainly consists of sensation care and scar care. 3 steps of Korea breast surgery post sensation care to prevent capsular contracture and to relieve pain. It activates the lymphatic circulation which eliminates the bruising and swelling quickly. Also, it removes the possibility of inflammation around the implant at an early stage and increases the blood circulation to prevent the capsular contracture. By activating the blood circulation, it increases the regeneration ability and drastically reduces the pain. By activating the blood circulation, it reduces swelling and minimizes the recovery period which ultimately increases the breast line elasticity. 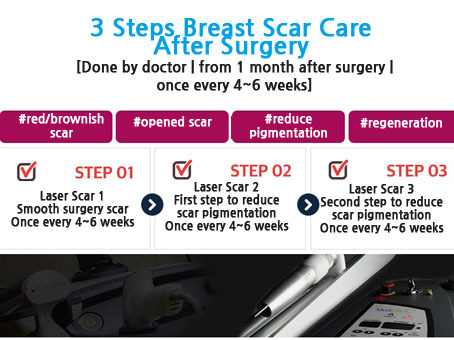 3 steps of Korea breast surgery post scar care! 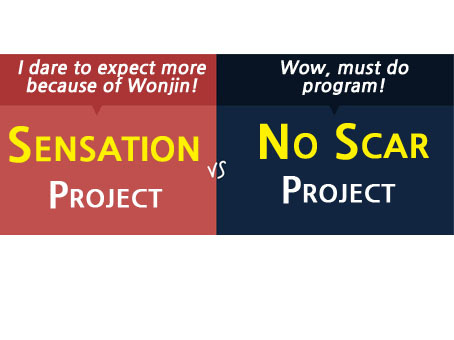 With the help of scar ointment, scar regeneration injection, and scar laser, Wonjin tries to help to reduce the concerns regarding the scar. 2) Scar regeneration injection for 1-2 times a week to help speed up the regeneration process.